Marvel’s TV branch doesn’t seem to have nearly the luck with spinoffs and wild swings as its movie counterparts – for every successful Defenders launch, there’s an Inhumans. And while Marvel movies have done well to embrace their youthful and silly sides with barn-burners like Thor: Ragnarok, Hulu’s Runaways feels more like Spider-Man: Homecoming stretched to an Iron Fist pace. The potential is there, but a cult/alien murder mystery set in high school should never feel this slow. Runaways draws inspiration from the Brian K. Vaughan and Adrian Alphona comic series of the same name, following six interconnected youths who discover their parents moonlight as supervillains. Hulu’s adaptation features The O.C. and Gossip Girl alum Josh Schwartz and Stephanie Savage running point; calling on a well of experience with angst-ridden teens and their complicated, equally well-drawn parents. It’s a delicate balancing act that Runaways has no fewer than sixteen major characters among its cast, but one that leaves the first four episodes weighted down with exposition and flashback, with little time to concentrate on any star standouts. The kids themselves are very much sculpted from the Breakfast Club mold. There’s Alex (Rhenzy Feliz), an intelligent, lonely teen hit hardest by the group’s division; Chase (Gregg Sulkin), a jock with a dark home life and secret knack for engineering; Nico (Lyrica Okano), a goth mourning the death of her sister; and Karolina (Virginia Gardner), a “#Blessed” girl with a sparkly secret and ties to a Scientology-esque religion that forms the brunt of Runaways’ early mystery. Perhaps most memorable of all are Gert (Ariela Barer), acerbic purple-haired feminist and her super-powered sister Molly (Allegra Acosta), both of whom discover some surprising family secrets hidden in their basement. 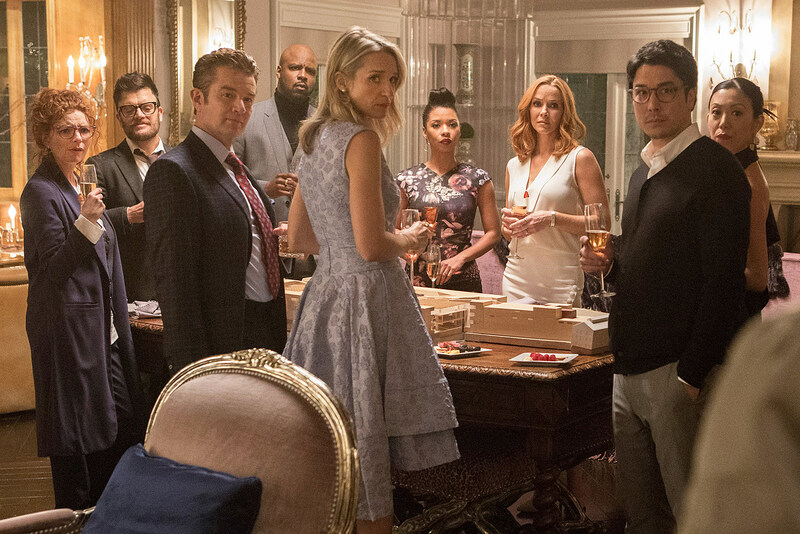 Runaways works at its best pinging the kids’ diverse perspectives off one another, or pairing them off to investigate their parents’ misdeeds, but seems repeatedly prone to wheel-spinning. All six witness their parents commit a heinous act early on, though the first four episodes fall into a familiar pattern of kids discovering some other inexplicable oddity in their home lives, and scrambling to cover it up before the parents catch on. The third and fourth hours spark some intriguing divisions among the so-called parental “Pride,” but simultaneously dance around more intriguing mysteries like a Darth Vader-esque big bad behind the scenes, or super-science and city-wide conspiracies run amok. For a series bent on lavishly fetishizing the scenic beauty of Los Angeles and its real estate*, Runaways seems not to recognize the value of its own unique oddities. *Largely unspoken, but it’s almost alienating how hyper-rich each character seems to be; living in automated mansions, attending high school with “Sitting is the new cancer” banners hanging in the background, and students that point to the “meditation center” sooner than a nurse’s office. Granted, Runaways is built largely for the YA mindset, and does manage to capture the angst of growing up (and apart). It’s an angry – almost sad – series at times, full of disappointment and powerlessness. There are aspects of abuse and sexual assault that come into play, bullying, and metaphors for puberty and isolation around every turn. Because the more Marvel-ous superpowered elements are fairly low-stakes early on, it can feel like Runaways isn’t certain what tone to strike. We’ve seen how well something like Spider-Man: Homecoming can balance high school mentality with larger-than-life set pieces and humor, so it feels like a missed opportunity for Runaways not to bring more levity to the genre. There’s plenty of potential here, and I don’t want to place Runaways anywhere on par with the unmitigated disaster of Marvel’s Inhumans. The problem is that Runaways has too many points of view to service early on, and even doubles back to re-run the pilot from the perspective of its parents. Near every episode relies on some sort of extended flashback, and because of that, the series’ fleeting moments of personality and chemistry never build momentum. This is a teen drama with a friggin’ dinosaur running around its edges, and still isn’t nearly weird enough. Intriguingly, this is the first Marvel TV series without any heavy-handed references to the larger Marvel universe. No name-drops, no “Incident,” no nothing. I can’t speak to each and every change from the comic books, but my understanding is that the natures of parental pairs in “The Pride” are presented as an ongoing mystery, rather than an immediate reveal. Someone’s got a Lyft product placement quota to fill. Marvel’s Runaways will premiere its first three episodes on Tuesday, November 21.